We're now into March, only a couple of days away from Spring. So, the flu season is pretty much over, right? Not exactly and, as it turns out, especially not this year. Yes, peak flu season normally runs December through February, but officially the full run of the flu season is from October to May, which is longer than you thought, right?1 And as for the season peaking in February, this year the flu seems to have done a Poltergeist. Just when you thought it was gone, it's back. Yes, the H1N1 flu we started the season with peaked in February, but a different and more virulent strain of flu seems to be just getting started. According to the CDC Weekly U.S. Influenza Surveillance Report for the week ending Feb 23rd, instead of peaking in February, the incidence of flu is still climbing.2 The CDC report goes on to say that, nationally, during the last week in February, influenza A(H3) viruses were reported more frequently than influenza A(H1N1) viruses. And that's what we're going to be talking about for the rest of this newsletter. The CDC says the milder H1N1 strain of influenza that defined this year's flu season, at least from Thanksgiving through February, is being replaced by a stronger, nastier strain (H3N2) that is making people a lot sicker than the H1N1 bug. Note: if you're curious about how flu strains are named and which strains are the most virulent, check out Vaccines: Good or Bad. It's not essential reading for today's topic, but it certainly is interesting. Flu activity remains high across the United States (and throughout the world in general), and there's a second wave of severe infections striking some states. There have been as many as 26.3 million flu illnesses, 12.4 million medical visits, and 347,000 flu hospitalizations this flu season between October 1st and March 2nd according to the March 2nd flu report released by the US Centers for Disease Control and Prevention.4 And it's still peaking. The expectation of the CDC and medical experts was that this year's flu season would be mild and drawing to close right about now. But then H3N2 began to appear in hospital emergency rooms, and the CDC is now estimating we will be dealing with this much nastier strain until May. Children and anyone born after 2001 are most at risk for H3N2 as they have little to no immunity to this strain, or any of its variants. And of course, anyone whose immune system is weakened due to diseases like cancer or HIV/AIDS is at high risk. Strain number. There are 16 different classifications of hemagglutinin (H) proteins and nine different classifications of neuraminidase (N) proteins, with the classifications being determined by the different antigenic responses each variation excites. The variations are numbered accordingly: H1-16 for hemagglutinin and N1-9 for neuraminidase. This is how names such as "H1N1" or "H3N2" are acquired. Note: not all variations are associated with flus that humans get. Host of origin (type of animal in which the virus was first identified. Think "bird flu," "swine flu," etc. That said, although many animals get the flu, only a handful carry strains capable of replicating in humans. For example, bats get the flu, but you never hear of bat flu epidemics associated with people. And on a related note, for viruses that originate in humans, no host is listed. Geographical origin (location/city in which the virus was first isolated). Think "Asian flu," Hong Kong flu," "Spanish flu," etc. Year of isolation. As in "1918 flu pandemic." Although flu symptoms are typically similar no matter the strain of influenza (Body aches, Fever, Headache, Sore throat, Cough, Exhaustion, and Minor congestion), the intensity of those symptoms can vary markedly depending on the strain. History has shown that seasons in which H3N2 influenza A is the dominant strain have generally been more severe. Exceptions can be found, of course, such as the 1918 Spanish flu and the 2009 swine flu pandemics, both of which resulted from an H1N1 virus. But again, in general, H3N2 flus are more severe. And this year follows form. People with this year's H3N2 are toxically sicker, many with pneumonia, dehydration, as well as a sky-high fever that just won't quit, out-of-control diabetes, uncontrolled asthma, heart attacks, and stroke (from the tremendous strain these diseases put on the body); and they have higher mortality rates. Compared to the H1N1 we've seen over the last few months, it's an especially nasty bug. To begin with, as yet, there is no immunization shot to specifically protect you against H3N2 this season. So, out of the gate, that's not an option even if you wanted to run down to your corner pharmacy and get a shot. Meanwhile, the World Health Organization's flu vaccine advisory group has concluded that flu vaccines should continue to address H1N1. But at the same time, they want future versions of the vaccine to address H3N2 as the next target, although recommending that any changes in the proportions of the vaccine addressing H3N2 be postponed as things are currently in flux.6 They also identified two Influenza B Viruses--Yamagata and Victoria--as currently in circulation. Note: Although at one time these two viruses were the same thing, the fact is that influenza B viruses split into 2 distinct lineages in the early 1980s, commonly named the Victoria and Yamagata lineages. And if that's not bad enough, in their review of the most recent flu virus activity, the advisory group identified two new pandemic candidate viruses--although perhaps not of immediate threat.12 The first is H5N6, which has been found in poultry in a handful of Asian countries but so far has been linked to only 23 human infections in China. They note that viruses matching that profile have been found in an increasing number of poultry and environmental samples from China, some poultry in Vietnam, and a common gull from Russia. The group also identified H7N4 as a potential threat. It said H7 viruses have caused several human infections over the years, but in January 2018 a genetically and antigenically distinct H7N4 virus caused a severe illness in a 68-year-old woman from China's Jiangsu province who had contact with live poultry before she became ill. The concern is that these two viruses could easily break out of their defined geographical areas, cross over into people on a much larger scale, and quickly become a global concern. As I've said on previous occasions, any vaccination, whether it's for you or your children, should be a personal choice. (Sadly, many states are moving away from that option.) But that choice should be based on facts, not fear and emotion. And no, the medical community does not have exclusive access to facts. Some of what they say about the flu vaccine is pure nonsense, such as claims of 50-90% effectiveness and 100% safety. But keep in mind, vaccination "may" be useful in lessening symptoms if you do get the flu for which you've been vaccinated or are exposed to a strain not specifically covered by the vaccine. 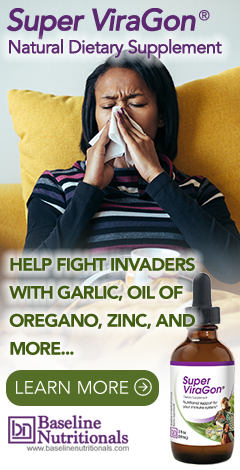 A natural antipathogenic formula to lessen the burden on your immune system if you do come down with the flu. This will drastically reduce your chances of experiencing a cytokine storm, minimize your odds of succumbing to a secondary infection, as well as shorten both the duration and intensity of any flu that you do get--regardless of whether or not you've been vaccinated. Oh yes, and one final thought to consider. If you happened to have had the flu already this year, having had the H1N1 flu offers no protection from the H2N3 flu or either of the type B flu viruses. Your body is still fair game. If you wander into the orbit of an infected individual, brush their hand, or inhale some droplets from a sneeze or cough while buying some organic food and vitamins at a Whole Foods, you could easily come down with a second flu this year--and potentially a much more severe case. I take mega doses of vitamin C and other nutrients as well as ViraGon. John Taylor, ND tells a story of how he got rid of flu symptoms in one day by taking good probiotics every two hours and bed rest in between. We suggested our customers to try our good probiotics with the same regimen, and many saw amazing results. Albeit many took more than one day to recover. Upper respiratory infections are preventable. Neither I nor my spouse have had one in decades. Ditto for flu shots - not one, in decades.